Nearly 100 mysterious manuscripts thought to be 1,000 years old and written by a Jewish family that lived along the ancient Silk Road have been discovered in an Afghan cave. Scholars and historians are excited about this new cache of documents, which was purchased by Israeli antiquities dealer Lenny Wolfe six months ago. 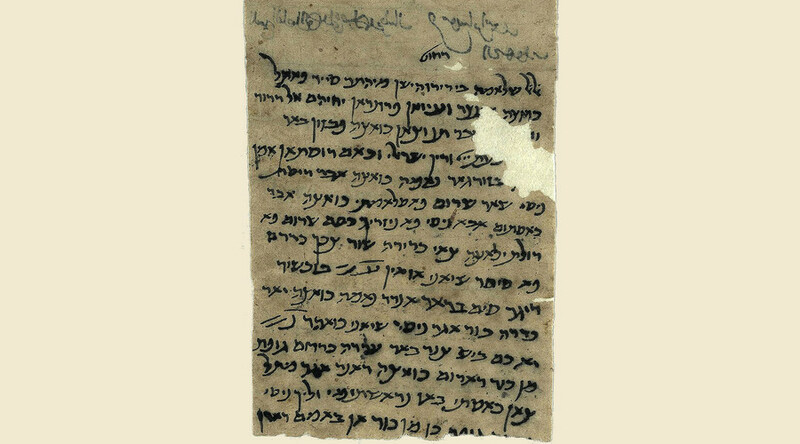 He came across them as part of an ongoing search for the "Afghan Genizah," a reference to the Cairo Genizah collection of 300,000 Jewish manuscript fragments discovered in a synagogue storeroom in Egypt. Written in a plethora of languages, including Aramaic, Hebrew, Persian, Judeo-Arabic, and Judeo Persian, these new documents are attributed to an 11th Century family headed by Abu Ben Daniel from the northern Afghan city of Bamyan, according to Haaretz. They would have been quite familiar with the area’s two biggest attractions back then and up until 15 years ago - giant Buddha statues built in the 6th Century and blown up by the Taliban six months before the September 11, 2001 attacks. Wolfe first purchased 29 of the documents in 2013, which he returned to Israel where they have been studied in the National Library. Since then, he’s been on the lookout for more documents from the family’s archive, at the behest of the Israel Antiquities Authority, and purchased the new batch six months ago. While Wolfe has yet to find a buyer from what he calls an "appropriate institution," it’s understood negotiations are ongoing and his asking price is unknown. Experts believe the documents, which contain only text and no illustrations, were originally buried in a cave around a 1,000 years ago by the owners, with the cache consisting of a mixture of legal and commercial manuscripts and sacred and personal letters. Wolfe came across a photograph of the documents "from southern Russia", according to Haaretz, before finding out in a European coffee shop that a Pakistani dealer had some of the ancient artifacts. Of the documents which have been studied to date, Ofir Haim, a researcher from the Hebrew University of Jerusalem, says they give a fascinating insight into the lives of the Jewish community in Afghanistan of the time, such as where they lived, worked, and functioned as a family. One such letter translated by Haim details how a man named Yair wrote to family head Abua Nassar about why he wasn’t returning to see his family in Bamyan. “Eggplants were not yet in abundance and so I did not send any. They were very small. I will send [some] next week,” Yair wrote in different letter, hinting at another reason why he is living in Bamyan. Wolfe’s latest batch also includes a notebook which Abu Nassar used to keep track of all those who owed him money over several decades, with some not only owing money but also quantities of wheat or barley. The several hundred entries, which are primarily Muslim names but did include Iranian Jewish names, allows historians to see how society worked at the time, particularly the economic problems they faced and how the different religions overlapped in day-to-day life.